Can anyone point me to a post or literature that shows SIMPLE f-hole construction drawings? I have the Muratov book and it's a few steps above my geometric skills I'm afraid. He talks about, for example, a "a 29" clothoid but he goes on to say he created his examples with special computer software. I was hoping to find something that the avearge guy can use to construct the ff-holes. I don't know of "generic" instruction drawings for f-holes. If such existed, surely they would be applicable to one of the strong individual styles only, such as A Amati, N Amati, Strad, del Gesu (or Stainer, I suppose). I'm not even sure that the design (not the placement, that's another matter) of f-holes can be reduced to a mathematical or geometric basis, such as the design of the violin. Hopefully other posters can provide more input on this. For example the Guarneri del Gesu iso line layout shows contours. top joint when viewed from the sides. curve of the top and bottom holes." of the sound-holes in violins of various dimensions..."
I have not been able to find the "Misura per gli occhi" anywhere else. Yes, but where are his drawings that they claim to have traced? In the "Museo Stradivariano" of Cremona perhaps? Has anybody been? I have this book called "the art of the violin design" by Muratov. He shows many examples of how all the various curves of the violin are constructed using clothoid curves. The book is however very advanced geometrically, and is difficult to follow. 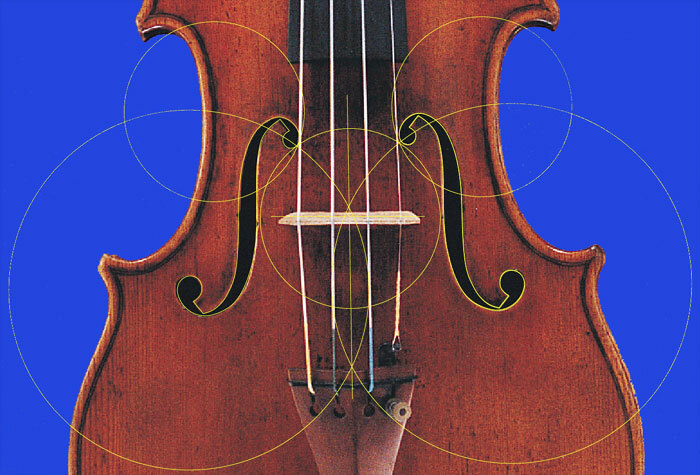 Reading through the book one assumes that all violin curves have been designed using these clothoid curves. Is this true or not? I seem to recall MD showing a simpler method of constructing f-holes some time back but cannot find it on search. Amori, I believe you will find that right on Micheal's on site. I was looking at it the other day. Murray, that is what I was talking about - Michael's illustrations are about "placement", not "design", as are the links provided by "scratchy rosin". Unless I've completely mistunderstood you, your question was about the design of the shape, not the placement of the f-holes? You are correct, I am tryng to find a "formula" to construct the design. It seems most makers just use a template obtained from a 3rd party? Thus far my f-hole designs have been based only on easthetics. For me a sensible approach would be to become familiar with the salient features of strong styles, which I've already mentioned in a previous post (to which I should probably add Maggini). On the other hand, if one cannot recognize these styles at a glance, I think one should perhaps indulge in a bit af aesthetic analysis. I'm not sure I would follow the logic of designing one's own f-holes if one cannot easily recognize the various classical styles, as well as having a solid understanding of the separate features (stem shape, wing shape and size, and to some degree, placement) which make them look the way they look. It is interesting, for instance, that many Cremonese f-holes have pretty close to a 45 deg. angle to the wing points, and that, basically, the angle points straight down, unlike, for instance, Stainer f-hole wings which follow the sweep of the hole. This point is also quite often pretty much at the center of the upper and lower sweeps of the hole. Not *always", but these features do seem to constitute some kind of basic idea, and would seem to contribute to the apparent design logic of classical Italian instruments. When this design logic is absent - as is the case with most old German/Tyrolean/Bohemian instruments - the overall visual impression easily becomes a bit haphazard. I'm guessing about this, but I think that free-hand drawing rather than mathematical proportions or geometric designs will be the way at which one arrives at one's own design. I'm pretty awful at free-hand drawing myself, but I can draw a pretty decent f-hole without reference to an actual example, based on what I know about the design principles of classical Italian f-holes. Incidentally, I felt that this exercise became necessary when I made a viola based on a small Gasparo instrument. I did not want to make a "copy", rather, a cleaned-up modern model. The f-holes on the Strad poster of that instrument were useless for such a specific purpose, as they are very roughly made indeed. In order to make clean, symmetrical/matching f-holes which would still be instantly recognisable as Gasparo, I had to do exactly what I described above: analyse them, and then re-construct my own version. There are images of this instrument on my website. This permitted a smooth curve to be constructed using a greatly enlarged image. This could be enlarged to the correct dimensions for making a template. The file is pdf format with vector graphics so no pixel limitations to zooming in. There are issues about the projected viewing angle, camera distance etc. and also it should be noted that the arching of the violin really should influence the carved shape. A more natural method could come from selecting the main hole locations using one of the techniques discussed above and then following the "iso" contour for the particular violin top. The "iso" contours could be used to establish a curved central spine between the end hole locations. The central width has to be soundpost setting capable and the carving is then a smooth blend using "gli occhi". Vector Graphic Curve PDF reader is required. I was not hugely unhappy with my #15 ff-holes, in the flesh they look okay - as viewed frm above. It's only since it was mentioned on the post that I started having a second look and realized that there was room for improvement. Especially as viewed from the rib side. I've been looking at all aspects of ff-holes, their design and placement. The book I have suggests that the design of ff-holes (and everything else) is made up of clothoid curves (which are difficult to construct) where my original design was made up of radii and elipses. Anyway, for simplicity, I have now decided that for the meantime, I must live with the f-hole I have now scanned and imported (into AutoCAD). Luckily it is close to the Betts model which I have loosely based this violin design on. I do want to look at proper placement though, and work on those parallel lines we spoke about. A combination of the AutoCAD file and Michael Darntons placement technique using 64mm and 32mm guide circles. The symmetry on the f-holes is remarkable, Antonio. If you look toward the end of the Muratov book he shows a simple method of obtaining an f-hole shape, using a bent wire. Esentially he bores the upper and lower eyes of the f-holes in the correct place, then puts a violin peg in the hole with a wire through the string hole in the peg. By holding the other end of the wire near the other eye of the f-hole the wire can be made to produce a nicely-curved f-hole outline that can be traced over. A similar method is suggested for the violin body outline. The current VSA Papers also has an article on producing outlines by bending a thin piece of wire or wood. Curves produced by these methods are easy to make, but apparently hard to analyze. I don't get 36° on the Strad above. I get 30°. Am I measuring it right please? the 36° was taken from a scan of the original drawing of the mould "G" held in the Cremona Museum. The Golden triangle is for the locating of the centers of the f-holes. There is a "BIG" difference between a "flat" drawing and a photo. I find that the illustrations that you provided do not establish any accurate evidence for 36° triangles. I believe that the proportions are established from the satisfaction of the eye, not from some pentangle theorem. I know you can find patterns in anything if you drop your accuracy and screw up your eyes and try really hard. To make use of any of that clothoid, spirial, french-curvy stuff you have to ignore a lot of the details that make a Cremonese violin a Cremonese violin--the bumps and flat spots that result from the joining of various circles (yes, circles) that make up the outline. If you want something that looks like all the character has been ironed out--sort of a blurry copy of a good violin--that's one thing, I guess, but it's not Cremonese. The examples in the Muratov book look remotely close if you need glasses, don't wear them, and don't concern yourself with precision, but it certainly doesn't have anything to do with classical violin design. Are you sure thats the correct translation for"Misura per gli occhi"? Hi Michael, my most fundamental design rule is "simplicity IS the essence of good design". If anyone looks at my furniture, industrial, graphic and violin designs this will be evident. I start this thread by asking if anyone knows of a SIMPLE way of doing the job. We do discuss the Muratov book but I dismiss it as being too complicated. If there is a simple way of constructing an f-hole (that is sympathetic to the deisgn of my violin) I have not found it and will then probably revert to my original method of doing it by sight. It's not so much the placement of the eyes but rather the connecting lines. The other concern now is achieve (almost) parallel lines between the f-holes and the ribs when viewed from the side.